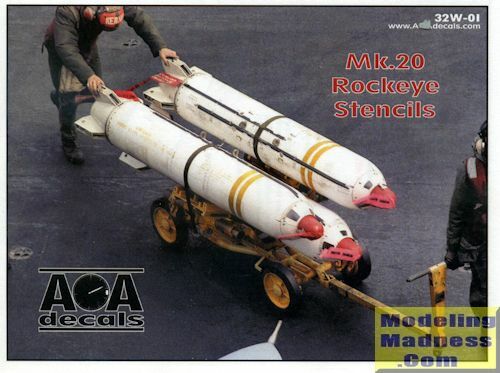 AOA Decals has added another nice line of markings for the enthusiast, starting with this set in 1/32 for the Mk.20 Rockeye. 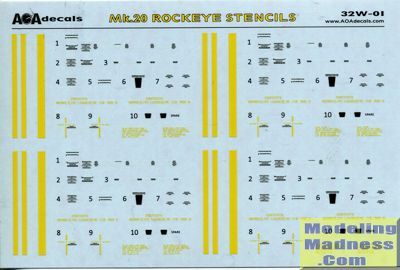 The decal sheet is designed for the AMS resin ones, but no reason they shouldn't work on any other weapons that come in kits. The sheet is printed by Cartograf and includes stencils and stripes for four weapons. There is a full color and placement guide provided that also gives you some notes concerning some of the markings. It is a very nice set and those building big scale modern aircraft kits will find this very useful.